When the people of Zarahemla met the elder Mosiah, they showed him a “large stone … with engravings on it” which Mosiah was able to interpret “by the gift and power of God.” The stone “gave an account of one Coriantumr, and the slain of his people,” and also “spake a few words concerning his fathers” and related the origin of the Jaredites “from the tower” (Omni 1:20–22). 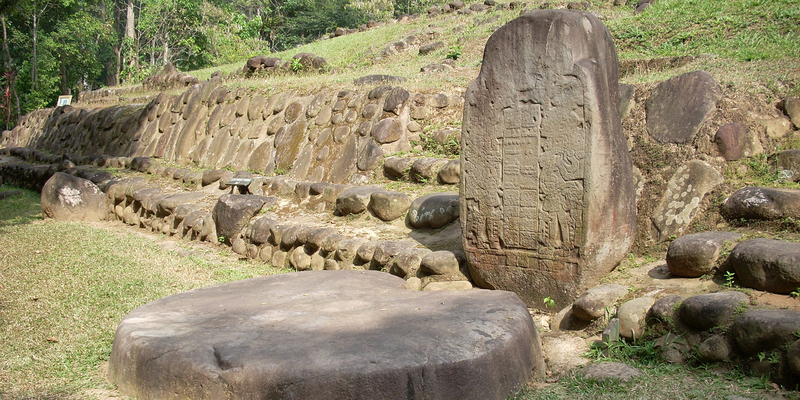 Early Latter-day Saints living in Nauvoo were interested to learn that explorers John Lloyd Stephens and Fredrick Catherwood had discovered a large, engraved stone among the ruins of Quiriguá in Guatemala. In October 1842, with Joseph Smith at the helm as editor, the Times and Seasons reported, “that a large stone with engravings upon it” had been found by Stephens, “among the left remembrances of the, (to him), lost and unknown.”1 This was seen as favorable evidence for the Book of Mormon by these first generation Mormons. The monumental inscriptions of Mesoamerica were not widely known in the United States until after Stephens and Catherwood published their findings in 1841.11 The excitement in and around Nauvoo over their findings in 1842 indicates that Joseph Smith and early Latter-day Saints were most likely unaware of things like stone inscriptions found in the Americas previously. Even as awareness of Mesoamerican stelae grew, the inscriptions remained undecipherable, and as such the understanding of their contents was limited. Before the 1960s, most scholars believed that Mesoamerican monuments had no historical content whatsoever, but exclusively depicted and described gods and myths.12 Yet the Book of Mormon described a “large stone” engraved with the history of a king, his battles, his ancestors, and the origins of his ruling lineage. Brant A. Gardner, Second Witness: Analytical and Contextual Commentary on the Book of Mormon, 6 vols. (Salt Lake City, UT: Greg Kofford Books, 2007–2008), 3:64–65. Daniel Johnson, Jared Cooper, and Derek Glasser, An LDS Guide to Mesoamerica (Springville, UT: Cedar Fort, 2008), 55–59 (sidebar). John L. Sorenson, “The Book of Mormon as a Mesoamerican Codex,” in Book of Mormon Authorship Revisited: The Evidence for Ancient Origins, ed. Noel B. Reynolds (Provo, UT: FARMS, 1996), 412–418. 1. “Zarahemla,” Times and Seasons 3, no. 23 (October 1842): 927. The authorship of this and other articles related to Book of Mormon geography which appeared in the Times and Seasons during Joseph Smith’s tenure as editor has been a point of dispute in recent years. See Neal Rappleye, “‘War of Words and Tumult of Opinions’: The Battle for Joseph Smith’s Words in Book of Mormon Geography,” Interpreter: A Journal Mormon Scripture 11 (2014): 37–95. 2. Brant A. Gardner, Second Witness: Analytical and Contextual Commentary on the Book of Mormon, 6 vols. (Salt Lake City, UT: Greg Kofford Books, 2007–2008), 3:64. 3. Kerry M. Hull, “War Banners: A Mesoamerican Context for the Title of Liberty,” Journal of Book of Mormon Studies 24 (2015): 108–109. 4. Hull, “War Banners,” 116–117: “The seemingly uninspiring description of the monument as simply a ‘large stone’ may actually be significant. As noted above, for the ancient Maya the word for “stela” was lakam-tuun, literally translated as ‘large stone.’ While possibly merely coincidental, that the precise designation of ‘large stone’ for a carved monument with writing on it would be given in the Book of Mormon as well as in myriads of ancient Maya texts is further indication of a shared cultural and linguistic origin.” Hull, “War Banners, 117 n.107 credits Mark Wright with first making the observation in a 2006 Book of Mormon Archaeological Forum Conference. 5. John L. Sorenson, “The Book of Mormon as a Mesoamerican Codex,” in Book of Mormon Authorship Revisited: The Evidence for Ancient Origins, ed. Noel B. Reynolds (Provo, UT: FARMS, 1996), 413. 7. Maline D. Werness-Rude and Kaylee R. Spencer, “Imagery, Architacture, and Activity in the Maya World: An Introduction,” in Maya Imagery, Architecture, and Activity: Space and Spatial Analysis in Art History, ed. Maline D. Werness-Rude and Kaylee R. Spencer (Albuquerque, NM: University of New Mexico Press, 2015), 46. Also note their rendering of lakam tuun as “big stone” on p. 45. 9. Robert J. Sharer and Loa P. Traxler, The Ancient Maya, 6th edition (Stanford, CA: Stanford University Press, 2006), 182–183. 11. For a history of the discovery of Mesoamerican ruins and civilization, see David Drew, The Lost Chronicals of the Maya Kings (Berkley and Los Angeles, CA: University of California Press, 1999), 18–110, mentions of discovered stela can be found on p. 33 (1576, in an unpublished Spanish letter), pp. 51–52 (1834, in official report to Central American Government), and several are mentioned between pp. 54–61 describing the findings of Stephens and Catherwood. Drew notes that after the initial discovery and interaction with the Maya in the 1500s, “all the earlier accounts of Maya culture and antiquities themselves turned into archaeological material buried in libraries and forgotten … for almost three hundred years” (p. 35). Spanish explorers began to take some interest again in the late-1700s and early-1800s, but political turbulence in both Europe and Latin America starting early on in the nineteenth century prevented serious exploration until the 1820s (pp. 36–45). Some of the Spanish material from the late-eighteenth century, describing Palenque, was translated into English and published in London in 1822, “but interest in the book was slow to pick up” (pp. 45–46, quote on p. 46). While there were some additional publications in Europe, in English and other languages in the 1830s, it was not until the works of Stephens and Catherwood in early 1840s “gave an eager public [in both the USA and Europe] the first extensive graphic record of a vanished and unknown civilization” (p. 72). 12. For a short, easy to read overview of this history, see Daniel Johnson, Jared Cooper, and Derek Glasser, An LDS Guide to Mesoamerica (Springville, UT: Cedar Fort, 2008), 55–59 (sidebar). 14. See Book of Mormon Central, “Why Does the Book of Mormon Mention Horses? (Enos 1:21),” KnoWhy 75 (April 7, 2016). Why Does the Book of Mormon Talk about a “Land of Jerusalem”?